When a pedestrian is hit by a vehicle, the ramifications are usually quite devastating for the pedestrian. For example, a 63-year-old pedestrian was hit by a motorist at the intersection of Old Hickory Boulevard at Hickory Plaza and lost his life as a result. The pedestrian was reportedly attempting to cross Old Hickory Boulevard when he was hit by a 2007 Pontiac Grand Prix, according to the Tennessean. Unfortunately, pedestrian accident deaths are becoming a common occurrence in Tennessee. In fact, pedestrian deaths increased close to seven percent in Tennessee in 2016, when compared with accident data from 2015, according to the Governor’s Highway Safety Association. The numbers are even more disturbing nationwide. The percentage of pedestrians killed in collisions with motorists increased by eleven percent in 2016 when compared to 2015 data. That represents the largest annual increase in both the number and percentage of pedestrian deaths in four decades. 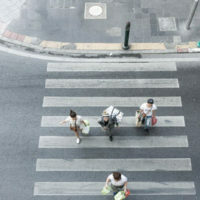 In many instances, a negligent motorist is the culprit for a collision with a pedestrian. Motorists have a duty to exercise reasonable care in operating their vehicle and when approaching crosswalks and intersections. Failing to exercise reasonable care is a breach of this duty and therefore constitutes negligence. The objective of a personal injury or wrongful death claim is to make the victim whole. This means that if you were injured in the accident, you can seek reimbursement for your medical bills, lost wages, and pain and suffering so you will be restored to where you would be had the accident not happened. In the context of a wrongful death claim, the goal is to assist the surviving family members financially so they can move forward with their lives after a loved one’s passing. A wrongful death claim allows the family to pursue reimbursement for funeral costs and burial expenses, along with future earnings that would have been made by the decedent, and compensation for pain, suffering, psychological trauma, and emotional anguish. Whether it is a personal injury lawsuit or wrongful death lawsuit, you need to take legal action right away. This is because Tennessee law requires a plaintiff to file an injury or death lawsuit in court within one year from the date of the injury or your loved one’s death. The Nashville pedestrian accident lawyers at Calhoun Law, PLC are ready and able to help you through the complex personal injury or wrongful death claims process. We have years of experience handling these types of cases and will work tirelessly to get the compensation you are owed. Contact us today for a free case review.